After breakfast we zipped up the tent, jumped in the car to cool down (another 30degree day) and set off for the city of Reims. Reims is located in the Alsace-Champagne-Ardenne-Lorraine (bloody mouthful) region of France, about 80 miles east-northeast of Paris. We opted to take the scenic route rather than the toll roads as we wanted to see a bit of the countryside and villages. 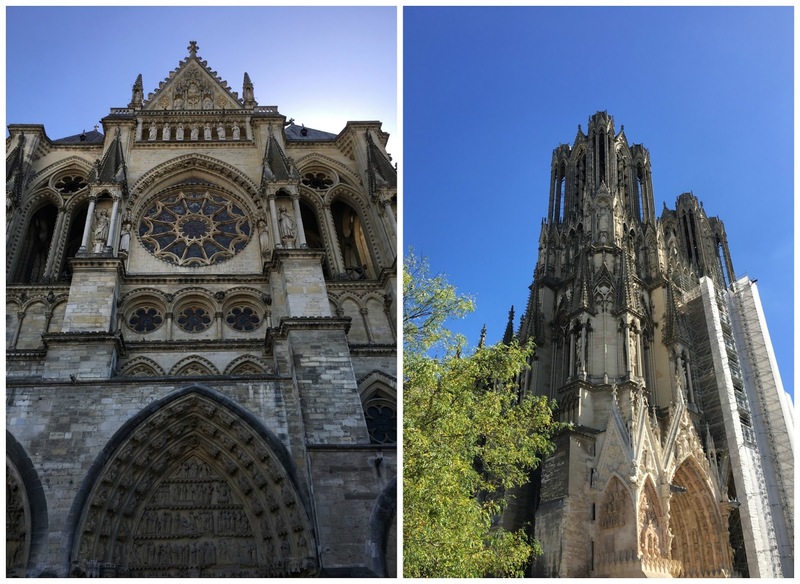 It was a beautiful drive to Reims on easy roads, and we kept stopping every now and then to take in the views and look at the odd historical monument and there were many of them. The region is steeped in so much history from 2 world wars with many war graves as a reminder to the brave soldiers who will never be forgotten. From our campsite it took us around 30 minutes to get there and we had no idea where we were going or where to park when we arrived. In fact we found ourselves driving down a road just for buses at one point. Never mind, we made it out alive and then followed directions to an underground car park situated right under the main street with the lift bringing you out literally in the middle of the restaurants and bars. Good times. We parked our bums in the nearest bar and ordered champers. It so reminded me of being in Paris, although a little less busy. Fabulous to sit and people watch in the glorious sunshine. 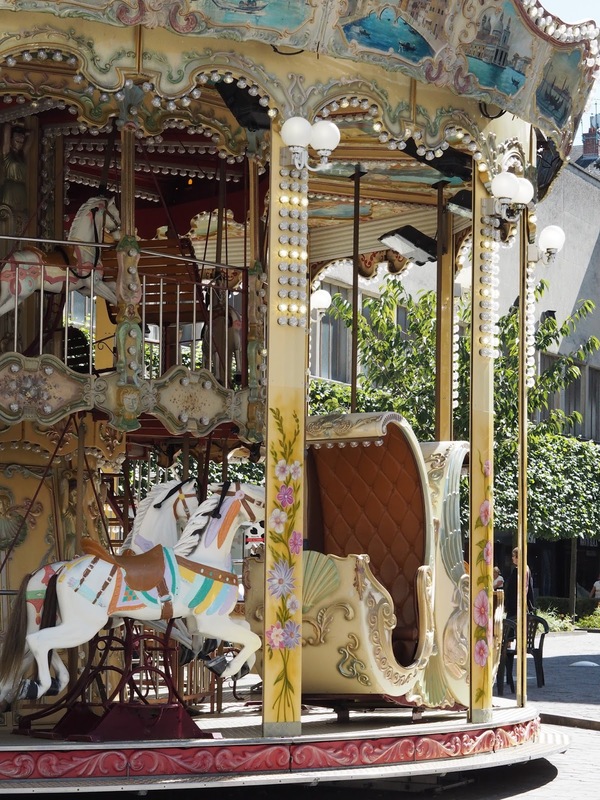 Reims itself is home to extensive history, culture and several champagne houses, the perfect combination don't you think? 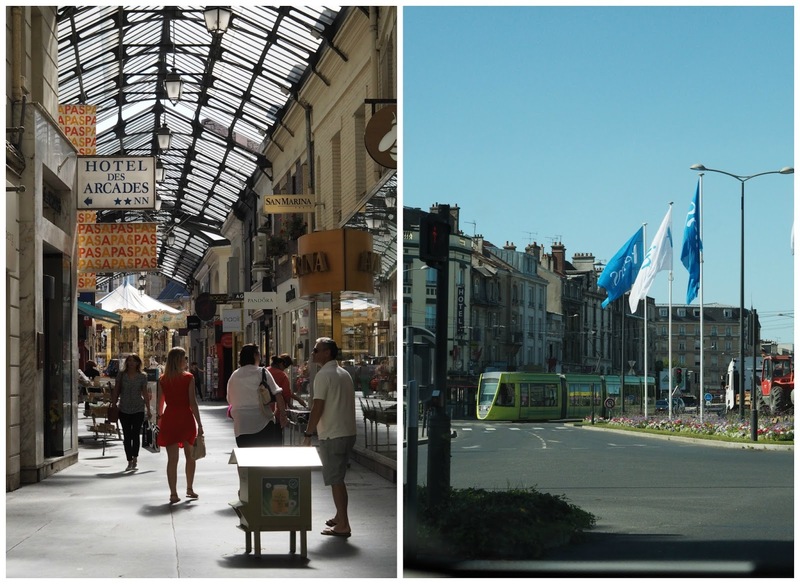 There's a main shopping area but also lots of little independent boutiques and even a Les Galeries Lafayette department store. You can get around easily enough on foot but there's also a good bus and tram network. 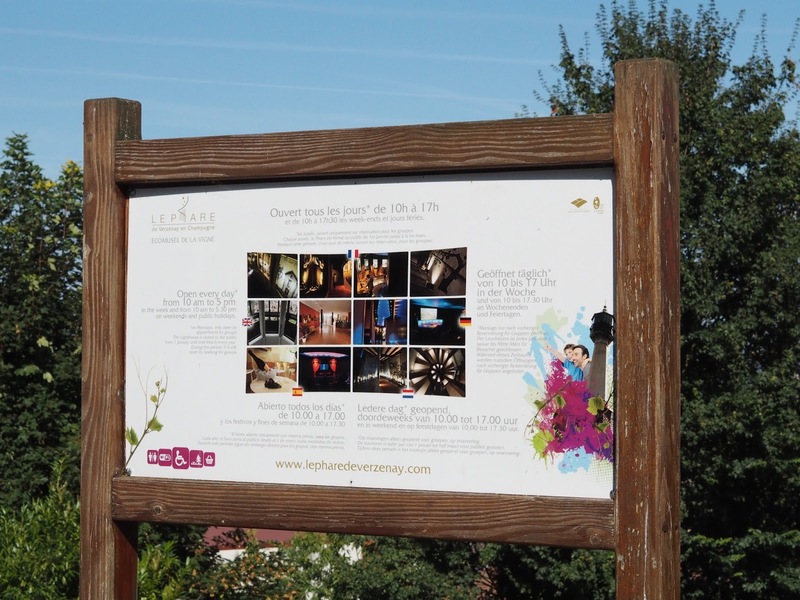 You might want to use them if you visit the champagne houses in Reims as they are slightly out of the centre. 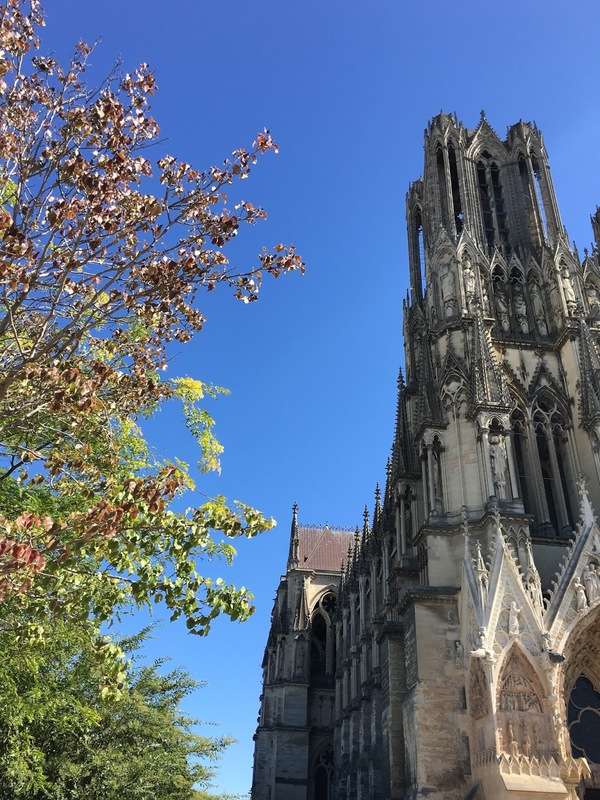 After sitting people watching for a while it was time to stretch our legs and go in search of the Notre-Dame de Reims. We didn't have to go too far, we turned a corner and there it was, bathed in glorious sunshine. The well known cathedral celebrated it's 800th birthday in 2011, and the French Kings were once crowned there, I mean wow! It suffered huge amounts of damage during those years, including fire and bombings from the wars but it remains a spectacular building that will leave you pretty speechless. It is absolutely huge and my photos do not do it any justice AT ALL. There are quite extensive renovations going on a the moment but it doesn't detract from it's beauty and the impact that it has. You can see in some of the photos where they're cleaning the stone. Sadly we couldn't see the main rose stained glass window at the front as it was covered by scaffolding which is a real shame, it's that round window that gives it the similarities to Notre-Dame in Paris, but in my opinion this one is more beautiful. 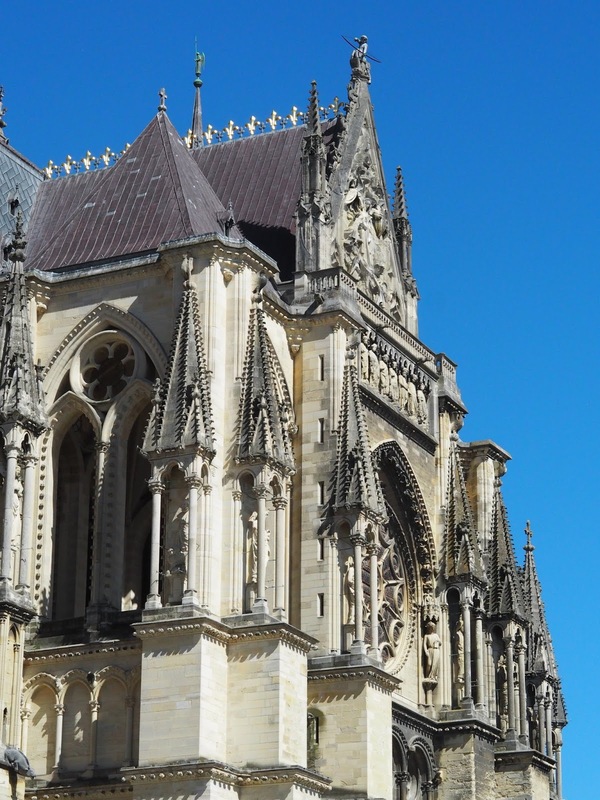 A visit to Reims is well worth it for the Cathedral alone but there's so much more to do. 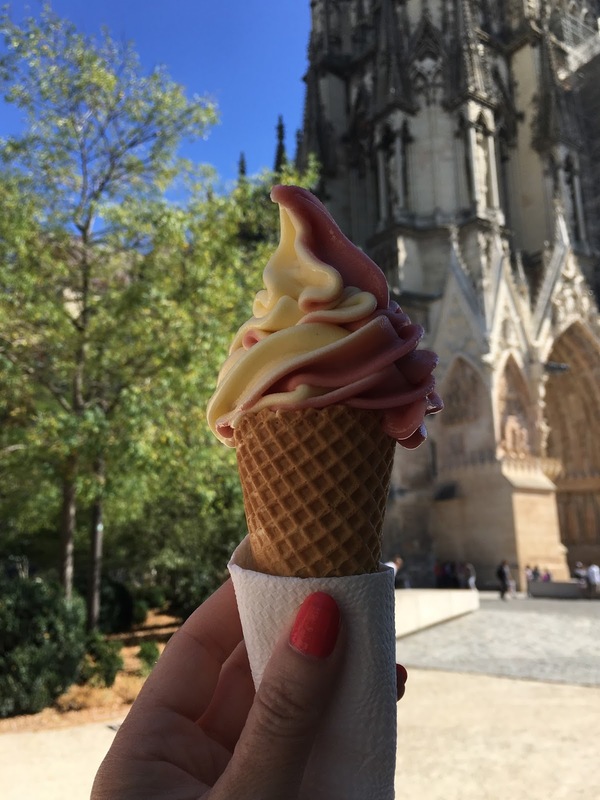 You can visit the Abbey of Saint-Remi, go on a champagne tour (more of that in another post), visit the museums, shop and of course EAT! Ooh don't forget to grab yourself an ice cream, find a spot on the grass or a bench and sit for a while and just take everything in. If I remember rightly we paid a visit to Le Phare on day 3 (we crammed quite a bit in so it's a little hard to remember) and this one was right on the top of Mr C's to do list. The journey was around 40 minutes through lots of quaint little villages with winding narrow streets. With over a 100 years of history Le Phare is a lighthouse in the midst of a sea of vines, as far as the eye can see. Situated in Verzenay in Champagne it's a unique building which now houses a museum at the bottom of the lighthouse, taking you through the history of making champagne to how it's done today. We paid 9 euros each for the lighthouse and the museum (no tasting). The top of the lighthouse (after climbing 101 narrow steps) offers panoramic views of the vineyards, villages, and the city and cathedral in the distance. Moving on to the museum, you walk around at your own pace with an audio guide and I found this bit really interesting and educational, and I actually learnt quite a lot. I never knew champagne was only made from three varieties of grape, chardonnay, pinot noir, and pinot meunier. Did you? Just look at that juicy bunch! When you look at them it's hard to imagine that the most delectable bubbles comes out of them! We picked up our first bottle to take home from here. Rosé grand cru if you were wondering. This place was so bloody peaceful, there were no crowds, just the odd few visitors and I could easily have stayed there all day, drinking in the amazing views and of course sipping on a bit of champagne every now and then. Le Phare is definitely worth a visit so if you do find yourself driving around the Champagne region promise me you'll go? If you missed part one of our road trip, then shame on you as it's all relevant but don't worry you can find it here and part 3 and maybe even 4 will be coming very soon!